I've been long LED lighting manufacturer $CREE for a long time, as readers of this blog know. Today, Cree continued to impress me with its quarterly earnings release, beating estimates and generating record revenue. They announced record revenue of $199.5 million for its second quarter of fiscal 2010, ended December 27, 2009, which is a "35 percent increase compared to revenue of $147.6 million reported for the second fiscal quarter last year and an 18 percent increase compared to the first quarter of fiscal 2010," according to a company press release. * Cash and investments increased $65.6 million from Q1 of fiscal 2010 to $954.1 million. * Cash flow from operations was $21.5 million. Free cash flow (cash flow from operations less capital expenditures) was ($19.9) million as we spent $41.4 million on capital expenditures. * Accounts receivable (net) increased $20.3 million from Q1 of fiscal 2010 to $113.4 million, resulting in days sales outstanding of 51, an increase of 1 day from Q1 of fiscal 2010. * Inventory (net) increased $7.3 million from Q1 of fiscal 2010 to $93.3 million and represents 80 days of inventory, a decrease of 1 day from Q1 of fiscal 2010. 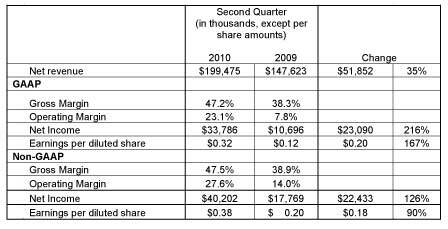 For its third quarter of fiscal 2010 ending March 28, 2010, Cree targets revenue in a range of $215 million to $225 million with GAAP net income of $37 million to $40 million, or $0.35 to $0.37 per diluted share. Non-GAAP net income is targeted to increase quarter-over-quarter to $44 million to $47 million, or $0.41 to $0.44 per diluted share, based on an estimated 107.5 million diluted weighted average shares. Targeted non-GAAP earnings exclude expenses related to the amortization of acquired intangibles of $0.02 per diluted share, and stock-based compensation expense of $0.04 per diluted share.